"Ever since mortality came upon Adam, men had feared death, the one enemy which could never be conquered. Herbs and medicines, prayers and surgery, medicine-men and priests, sorcery and magic, all had been used for milleniums in an attempt to overcome, or at least to postpone death but, in spite of all the machinations and efforts of men in all the earth, up to this time they had failed; and the rich and poor, ignorant and educated, black, brown, red, or white, priest and people, all had gone down in death and gone back to mother earth. "But now came the miracle— the revolution, the unbelievable marvel which none could explain and which none could deny. For the body which these hosts had seen persecuted, tortured, and drained of its life's blood, and left dead upon the cross; the body from which all life had ebbed; the body which lay entombed those long hours in a small, closed and sealed, oxygenless room into the third day; the person who had suffered the fate of death like hundreds of millions before him was calmly walking in the garden, animated, fresh, alive! "No human hands had been at work to remove the sealed door nor to resuscitate nor restore. 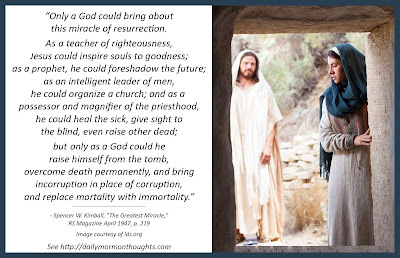 No magician nor sorcerer had invaded the precincts to work his cures; not even the priesthood, exercised by another, had been brought in use to heal, but the God who had purposefully and intentionally laid down his life had, by the power of his godhead, taken up his life again.... The spirit which had been by him commended to his Father in Heaven from the cross, and which, according to his later reports, had been to the spirit world, had returned and, ignoring the impenetrable walls of the sepulcher, had entered the place, re-entered the body, had caused the stone door to be rolled away, and walked in life again, with his body changed to immortality, incorruptible—his every faculty keen and alert. 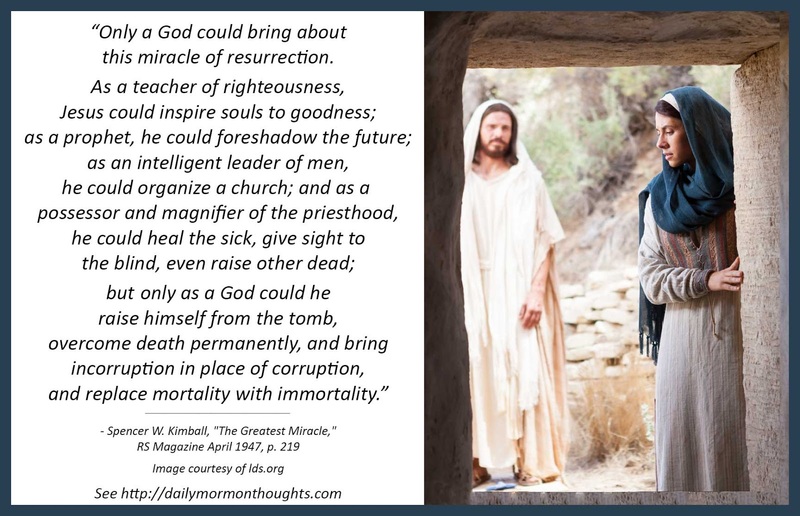 "And so we bear testimony that the being who created the earth and its contents, who made numerous appearances upon the earth prior to his birth in Bethlehem, Jesus Christ, the Son of God, is resurrected and immortal, and that this great boon of resurrection and immortality becomes now, through our Redeemer, the heritage of mankind." The fear of death that had gripped all humankind from the beginning was overcome by the hope and anticipation of the resurrection. No longer did mankind have to fear that death was the end of existence. 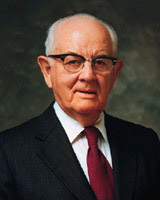 And while we still cling to life in every way we can, we also know the "most dreaded enemy, death, had been overcome" by the Savior's act on our behalf.